A localized lone pair is a lone pair electron that does not participate in resonance. Compared to a delocalized lone pair, the localized lone pair does not take place in resonance. The reason for this is primarily because the lone pair, in this case, occupies the hybridized orbital and not a standalone p orbital. A great example to consider is that of pyridine. In the pyridine molecule, the lone pair on nitrogen does not take part in resonance even though it is allylic to the pi bond. Hence, being allylic to pi bond is not the only criterion that governs whether or not the electron pair takes part in resonance. However, for pyridine, the lone pair occupies the hybridized orbital since the p orbital is already used in the pi bond. Therefore, when an atom has a pi bond as well as a lone pair of electrons, only the pi bond takes part in resonance. 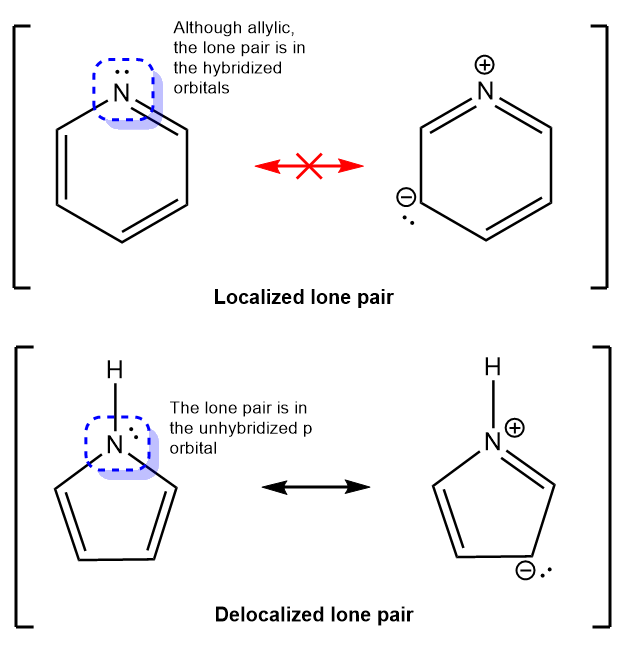 the lone pair remains localized.